Delight in our Spinach-Stuffed Chicken Breasts for Two. 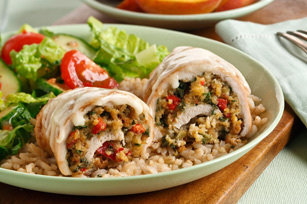 Spinach-Stuffed Chicken Breasts for Two are perfect for an intimate evening with a loved one. Bring water and 1 Tbsp. dressing to boil in large skillet on medium-high heat. Stir in spinach, stuffing mix and peppers; cover. Remove from heat. Let stand 5 min. Place chicken, top sides down, on cutting board; spread with stuffing mixture. Roll up, starting at one short end of each breast. Place, seam sides down, in 8-inch square baking dish; brush with remaining dressing. Bake 35 min. or until chicken is done (165ºF). Top with cheese; bake 5 min. or until melted. Place 2 chicken breasts in large freezer-weight resealable plastic bag. Pound chicken with side of heavy can, rolling pin or meat mallet until desired thickness. Repeat with additional chicken breasts, if necessary.